Each room leads outside to a patio or balcony with panoramic views overlooking both the mountain and the Bay. All bedrooms are equipped with tea making facilities, bar fridge, TV, hairdryer, safe, heater and fan. 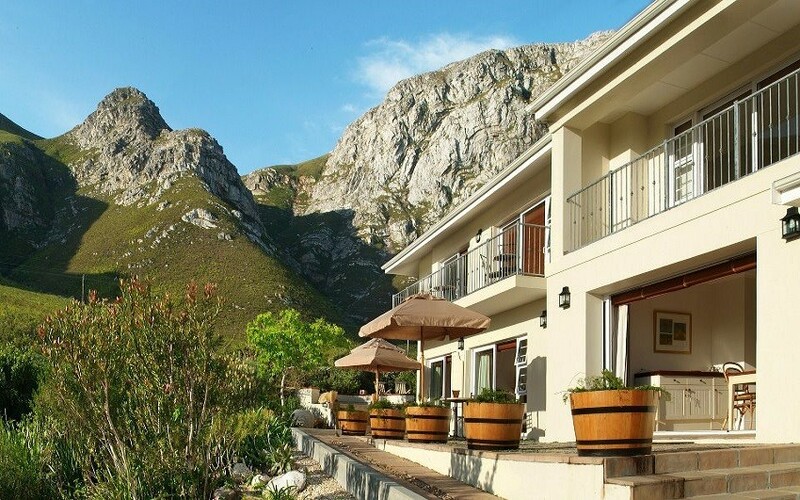 Overlooking one of the loveliest views in Hermanus, between the Mosselberg Mountain and Walker Bay, lies FrancolinHof Guest House. Thanks to its fine position bordering Fernkloof Nature Reserve, mountain walks, birds (including francolins! ), proteas and other fynbos are prolific on your doorstep. In addition, the Blue Flag Grotto Beach is just a 10 minute walk downhill and the old harbour in the centre of Hermanus is a 10 minute drive away. Go up Sir Lowry’s Pass, pass the turn offs to Elgin & Grabouw, and continue up the Houw Hoek Pass. As you descend the other side you will get to a very sharp hairpin bend corner and soon after that you will begin to see the signs for the turn off to Hermanus - R43. ** About 24 kms after the Arabella Golf Estate you arrive in Hermanus. Follow the signs to Stanford/Gansbaai which will take you through Hermanus – until you reach a large traffic circle (roundabout) – the only one you will come to!! Go ½ way around the circle (ie keep going straight!) past the Friendly Seven Eleven store on your left, and just as you come to the top of a small rise in the road, you will see 10th Avenue. (One signboard will point right to Grotto Blue Flag Beach and other points to ‘guest house’ left up to the mountain.) Continue straight up 10th Avenue – we are at the very top of the road. This room is downstairs, wheelchair accessible and opens onto a patio. The bathroom has a romantic double shower, underfloor heating and a heated towel rail for those chilly winter nights. This large room is also downstairs leading onto the patio. The bathroom has a candle-lit bath and separate shower as well as a heated towel rail and underfloor heating. The Seagull Room is upstairs and leads onto a balcony. The bathroom has a shower and double wash basins as well as a heated towel rail and underfloor heating. This generously sized upstairs corner room also leads onto a balcony. The bathroom has a bath and separate shower - both with lovely mountain views. The bathroom also includes underfloor heating and a heated towel rail.